Talk about incongruous. The man known as the “Apostle of the Alleghenies,” and the founder of the town of Loretto, Pennsylvania, was a Russian Prince reared in the Hague as the sophisticated, freethinking scion of a diplomatic noble family. Father Augustine Smith, as he was known for years in this country, was born to Prince Dimitri Alexeievitch Gallitzin and his German wife, Amalia von Schmettau in 1770. The Gallitzins were old Russian nobility — Orthodox in name only, as the elder Prince Dimitri and his bride had become children of the Enlightenment. In her own right, Amalia was a German Countess, whose Prussian father was a favorite field marshall of Fredrick the Great. The hand that rocked the cradle ruled the world of our future American apostle. Raised a Catholic until age nine, when a freethinking tutor soured her on religion, Amalia passed through a number of strange enthusiasms on her way back to the Faith of her baptism. From being a disciple of Diderot and Voltaire (the former of whom was a frequent household guest in the Gallitzin home), she began to follow an eccentric Dutch antiquarian named Hemsterhuis, after whose tutelage she came under the salutary influence of a formidable German educator in the person of the very Catholic Baron Franz von Fuerstenberg. The Baron, who did much to improve education in Westphalia after the suppression of the Jesuits, had in his circle of collaborators many priests who helped ensure the Catholicity of his energetic undertakings. After a providential illness, Amalia was brought back to the Faith. She would not be — could not be — mediocre in its practice. Princess Amalia wanted to be another Saint Monica, and her son, of course, was to be another Saint Augustine, even if she had to drag him to that pinnacle of greatness kicking and screaming. Lacking Monica’s demure nature, the princess was a strong personality, charming, brilliant, beautiful, and — how say it? — excessive in everything she did. One gets the impression that the princess brought to every venture, including child-rearing, the decisiveness of one squeezing the last bit of toothpaste out of the tube, though she looked good doing it. She was a bright light who often eclipsed all around her, including her son, whom she found disappointingly “empty” well into his teens and beyond. At age twenty-one, “Mitri,” as he was known to the family, would do what all aristocratic young men did before embarking on a career. He would take his world tour to complete his formal education with the experimental knowledge one gained by travel. His was to be a two-year tour, but where to do it? Europe was in the throes of war: In the West, France was in the convulsions of the Jacobin Revolution; in the East, Russia’s Catherine the Great had her “Greek Project” — war with Turkey. It was decided that Mitri would tour not the Old World, but the New. He would travel with a priest named Father Brosius, an educator and brilliant mathematician who had his heart set on more than math: He wanted to add to the Church’s numbers in America by responding to Bishop Carroll’s call for German-speaking priests. He would be a missionary. But he would also be the personal chaplain of Mitri on his two-year tour, or so the Princess thought, for she had arranged it. When the duet arrived on October 28, 1792, Bishop Carroll was not thrilled over the idea of a much-needed missionary acting as tour-guide-chaplain for a Russian prince making his own in the world. He discreetly ignored Mitri’s accompanying letters of recommendation from the princess and a German bishop, suggesting that, temporarily at least, Mr. Augustine Smith (Mitri’s new name in America) would be a welcome guest at the one-year-old Saint Mary’s Seminary in Baltimore. Whether or not the bishop planned it, Mitri’s stay at the seminary awakened in the phlegmatic prince a keen desire to be a priest, an American missionary priest. Carroll was skeptical. A Russian aristocrat was not exactly fitted for the hardscrabble life of a frontier missionary. He took the young man with him on some of his rounds of the diocese, which, in its entirety, was all of the U.S.A. Mitri liked what he saw. He went to the seminary and excelled in his studies. Having the best education Baron von Fuerstenberg and his mother could offer helped. He was ordained priest on March 18, 1795, becoming the first priest to receive all his orders (minor and major) in the new Republic. During his first assignments, the young priest acclimated himself to his ministry with difficulty. He was not practical, not very good with people (at this early stage of lay trusteeism, some folk were already quite uppity), and no good with money. He also seemed to have some of his mother’s restlessness and asked for new assignments when the old ones were not yet old. Bishop Carroll was discouraged at times. But deep humility and true apostolic zeal were there, and upon that foundation much could be — and was — built. Early in his missionary career, in 1796, a fateful sick-call to a dying Protestant woman in the Alleghenies would give Mitri a glimpse of his future apostolate, indeed, of his life work. The woman, a Mrs. Burgoon, lived on what was known as McGuire’s Settlement, named after an officer in the Revolutionary army, Captain Michael McGuire. The entrepreneuring captain began what amounted to a small Catholic colony in what is now Cambria County, Pennsylvania. The settlement started on a 1,200-acre parcel McGuire purchased near the summit of the Alleghenies in 1788. Mrs. Burgoon died a Catholic. 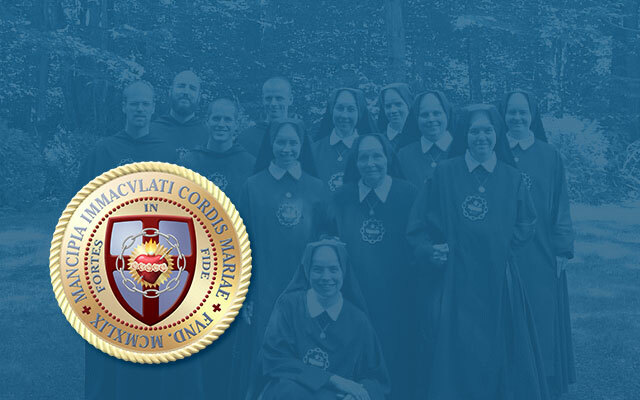 Eventually, Mitri would have Bishop Carroll’s blessing to begin an apostolate among the dozen Catholics of that settlement. It would be his home base for missionary excursions to the Catholics scattered about the region, many of whom had rarely seen a priest before. (Some baptisms, for instance, were of twelve-year olds from Catholic families, so rare was a priest in those parts.) Father Gallitzin was ideal for this undertaking, as he would be able to apply his own personal monies to building a church, house, and other necessities for the new mission. But he did more that that. He wanted to build a flourishing town in the woods. He funded construction of saw-mills, grist-mills, and tanneries. He began a general store and established other industries, all for the benefit of his flock, which grew astronomically. From a dozen Catholics at the beginning of his ministry, McGuire’s settlement blossomed into the town of Loretto — Gallitzin’s name of choice — wherein dwelt 10,000 Christian souls at the death of its priestly patriarch. As with any good work, Father Gallitzin’s project in the backwoods of Pennsylvania was blessed with the sign of the Cross. Lay trusteeism, elsewhere rampant in the Church in this country, was not a problem. After all, he owned the small church he had built for the people. His were other problems: The uncouth folk among whom he worked could be ungrateful at times. Some accused him of great mischief when he tried to turn pious young ladies into schoolteachers for his Catholic school. True, Mitri was not yet the soul of discretion and prudence (lessons he would have to learn the very hard way), but the accusations of impurity leveled at him were worthy only of contempt. When that episode blew over, another, worse one took its place. Under the influence of a provocative Irish wanderer who enjoyed the sport of setting factions against each other, many of his people turned on Mitri with vitriol. The controversy turned around politics: Mitri was an apolitical Federalist, but his people were mostly Republicans, and the Jefferson administration served to politicize the heretofore politically inactive and still politically ignorant common man. One thing led to another, and, along with a whole host of other crimes, Mitri was accused of harboring monarchist and anti-American leanings. In this case, the provocateur himself eventually confessed his guilt openly in the church of Loretto. More harrowing perhaps, because of much longer duration, was his debt situation. Being Prince Gallitzin, he was entitled to a princely fortune when his father died. And his generous mother sent him money from time to time. On the strength of this credit, be borrowed large sums to fund the charitable enterprises of his mission. The sums were enormous for an American backwoods entrepreneur, but trifling for a man of the wealth he was to have — or so he thought. As a Catholic, and especially as a cleric, he found himself cut off from his inheritance by Russian law. For many long years he worked under the delusion that his sister, Mimi, would send him his portion of the family fortune once she took possession of its entirety. Her marriage to an aristocratic gambling addict rang the death knell of that hope. When the pauper-prince was most hard-pressed, financial help came from Europe, especially in the person of one of his childhood playmates, now William I, King of the Netherlands and Duke of Luxembourg. King William’s largesse was far from sufficient, however, and poor Father Gallitzin had to go around begging. He tried to get money from wealthy Catholics in America — a rare breed, to put it mildly. What little he got from them had to be offset by widow’s mites, lots of them. He got what he needed, every penny, from poor Irish laborers who were shoveling and picking through the Alleghenies. (Pennsylvania was then trying to compete with New York in connecting the Eastern Seaboard to western trade routes.) The Irish, who had given him problems before, came through — literally, in spades. In the midst of traveling great expanses on horseback to confess, communicate, and anoint his faithful, in addition to the charitable work of building a viable town for his flock in the wilds of Pennsylvania, and aside from fighting off debt, calumny, and waging war against the vices of backwoodsmen (heavy drinkers), Demetrius Augustine Gallitzin found time to become the first Catholic controversialist in the new Republic. On a day dedicated by President Madison to“prayer and humiliation” for the country in 1814 (the occasion was Washington’s being burned down by the Brits), a Presbyterian by the name of Reverend Mr. Johnson took the opportunity to lambaste “popery.” (Being, like Mitri, a Federalist, the minister could not be too enthused over Madison’s piety, so he had to preach about something both he and his Republican congregation could get behind.) The sermon was so good, he thought, that he had it published. Russian fireworks went off when Father Gallitzin saw it. He authored and published his response: A Defence of Catholic Principles. A masterpiece of simple apologetics, it stunned the ersatz popeslayer. The Reverend Mr. Johnson did not respond for two years, and at that point could do no more than resort to invective and ad hominem attacks. Gallitzin’s first work in apologetics was followed by two others: A Letter on the Holy Scriptures and An Appeal to the Protestant Public. These works produced conversions and won Mitri acclaim as a defender of the Faith. “The question then before us is concerning theological toleration, viz. whether Almighty God can approve of so many different religious systems, which we find established upon earth; whether all these different religious systems can be considered as so many different ways to heaven. If so, we ought to be in favour of universal toleration. Not only did this doctrinaire booklet put to silence the foolish man who attacked the Church; it also won over some converts for the first Catholic controversialist in our nation. Even Protestants who did not convert learned to respect the Church of Rome. His few excursions into public polemics were not the only occasions of celebrity for Loretto’s pastor. Earlier in his missionary career there was the strange episode of the “Wizard Clip,” a series of extraordinary preternatural phenomena apparently involving a soul from Purgatory “haunting” the house of a Lutheran family. The family, the Livingstons, eventually converted, as did other Protestants in the area (see Father Gallitzin and the Cliptown Exorcism). Amalia’s reluctant Augustine grew old and wise among his people. He had matured into a prudent, even shrewd man, whose quirks only endeared him to his flock. He was small of frame, toothless (thanks to an inept dentist), and eccentric in many ways. Among the crude denizens of the mountain frontier — he once had to put up a “do not spit on the floor” sign in his chapel — he yet remained the soul of refinement. And he loved these provincial folk beyond their apparent lovability, much as the original Augustine loved the rough inhabitants of Hippo. Preaching to them with a firmness to the point of strictitude, he would also entertain them with his clarinet as they lumbered home from their hard day’s labors. But he had learned the hard way not to be too close to any one of them, so his few private moments were spent friendless. On winter evenings he would play his violin by a fire in the basement, his black mastiff being the only companion to share the music. For forty-one years did Father Gallitzin work from his rustic mission base in Loretto, building a Catholic community, educating his people, and bringing sacraments to far-off places. Most of those years he was unassisted by other priests. In his old age he was given priestly help. He needed it. A few years before his death, he fell off his horse and suffered the double hernia which, strangulated, would eventually take him. In his old age, his main mode of travel year round was a sled drawn by two horses, the mastiff usually trailing behind. A doctor had given him precise directives on how to care for himself in this condition. Mitri followed not one of these directives. He preferred an honor next to that of martyrdom, in his own words: “that of going on with his labors until he should collapse like an old worn-out cart-horse.” Father Gallitzin collapsed in death on May 6, 1840, after wearing out his old cart-horse of a body during Holy Week and Easter. A notable curiosity of Gallitzin’s legacy — particularly for us — is the fact that one of his earliest biographers was Sarah Brownson, the daughter of America’s greatest apologist, Orestes Brownson, that lion of a man who looked forward to the day when Russia and America would be the great Catholic nations respectively of the East and West. 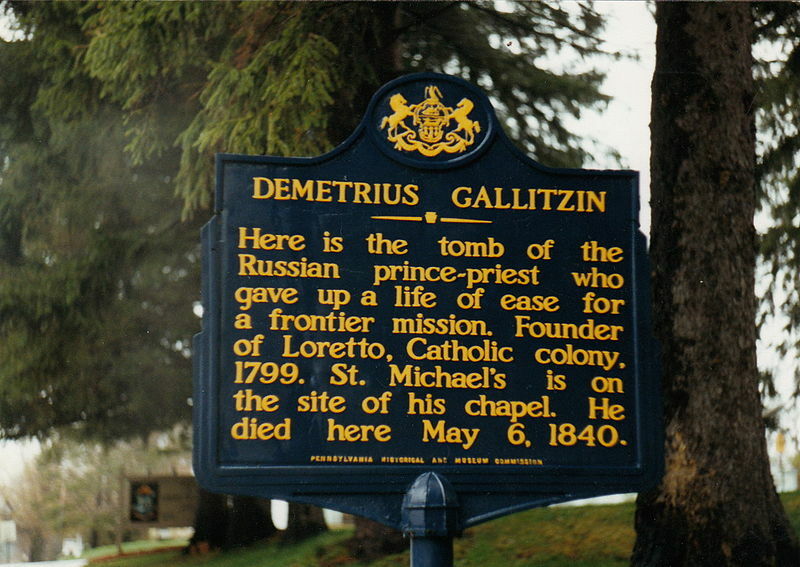 Prince Demetrius Gallitzin’s cause for canonization has been introduced to the Holy See. On June 6, 2005, he was made a “Servant of God.” His cause is promoted by the Diocese of Altoona-Johnstown. There is also a website specially dedicated to his cause: http://www.demetriusgallitzin.org/.